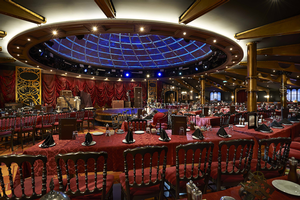 I knew I was in trouble when Norwegian Cruise Line’s communications team directed me to sit at a table just in front of the stage of a new dinner show, The Illusionarium, on Norwegian Getaway. The show is only performed on the line’s brand new, 4,000-passenger ship, set to be officially christened this week in Miami. People who had seen the show said there was audience participation, so I figured there was a good chance I’d be picked because I was sitting so close to the action. The Illusionarium, an original production developed by Norwegian itself, is technically a magic show. But to call it just that is to sell it way short. The show actually features five different magicians, each focused on a specific discipline. Most of what they do might seem quite familiar. There’s an act where a woman is put into a box, which grows much smaller, and then she’s supposedly “impaled” by large swords wielded by the magician. But I was sitting up close and I couldn’t figure out how they did it. There’s another act where another magician levitates various objects—tables, chairs, candles, etc.—around the stage and above the audience. Yet a third magician produces white doves out of seemingly nowhere and places them into a cage, until he makes the entire cage disappear. Of course, there was the act that I was involved with—the hypnotist. He asked for volunteers but really selected me and another person in the audience without waiting for anyone to even raise their hands. I went along—I mean, why not, I’ve always wanted to try to figure out how such acts are done. The two of us were seated in two chairs looking out over the stage. The hypnotist then asked us in a calm, soothing voice to close our eyes and start thinking that we were walking up a set of stairs towards a door and then heading into a light. PHOTO: The Getaway looked to be playing a dual role as ice cutter while docked in a near-frozen New York City. He then asked us to let him know if we felt a tap on our shoulders or a feather being against our noses. I subsequently felt two hard taps on my right shoulder, as did my fellow audience member. I also felt the feather against my nose. The audience laughed when I told the hypnotist what I had felt. Now the clincher: As I left the stage after being dismissed, everyone in the audience near to me told me that I was never touched by the hypnotist, either on the shoulder or with the feather. However, the other participant in this little experiment had been touched. The implication was that somehow his sensory perceptions had been transformed over to me. Now I’m a pretty practical person and I definitely felt what I felt, but neither I nor anyone else in the audience could figure out how the hypnotist had done this … unless there definitely was some hypnosis involved. In the end, it was a fun experience. Indeed, The Illusionarium (which costs an extra and well-worth-it $30 per person) is a unique magic show that is one of the best performances I’ve ever seen on a cruise ship. The dedicated theater has great special effects, some amazing renditions of classic magic, and a very funny conclusion involving the fifth magician ... and one that I played a bit part in too, owing to my proximity to the stage. It all goes to show how entertainment on cruise ships has come in the past few years. I used to grow weary of the warmed-over Broadway reviews, bad singers and B-grade comedians. Nowadays there are full Broadway shows (Getaway has a great production of “Legally Blonde”) and special productions like The Illusionarium that can only be seen on the ships that offer them. Yes, the grand cruise ships of today have certainly become destinations unto themselves, with a plethora of dining choices, great bars and lounges, and a full array of top-notch entertainment. There are those who still believe that destinations and ports of call should define the cruise experience, but this is a very different type of cruising. For the mega-ships, it’s all about the onboard experience…and for many cruisers, that’s exactly what they want. 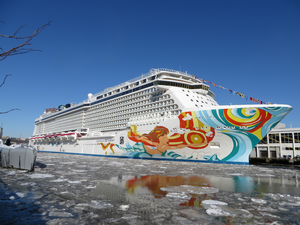 Click on Norwegian Getaway for my initial story on the entire ship.